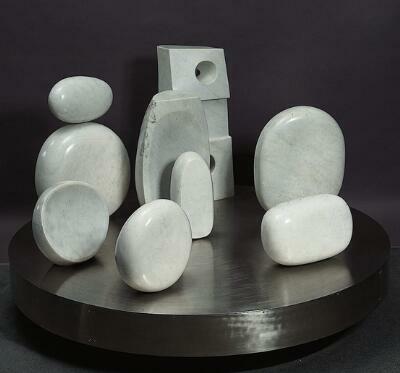 Assembly with Sea Forms from 1972 is a collection of eight abstract forms in polished white marble, mounted on a metal base. It is one of the last major works by Barbara Hepworth. Walk slowly around the group. As you do, notice how the relationship among the pieces and the sculpture as a whole shifts as you move. Hepworth carved each unit into the essence of a sea form, smoothing shapes and surfaces to convey the impact of wind, water and sand. She gave each a name—the tall rectangular shape, for instance, is called Sea King and the hollowed piece with the smaller form in front of it is Sea Form with Young. All units relate perfectly to each other in color and shape, and unite in perfect harmony. Today, Hepworth is recognized one of the leading British sculptors of the 20th century. She died tragically in 1975, in a fire at her studio in St. Ives, in Cornwall.